This gem from the 1930’s finally came to fruition for the “Mergers & Acquisitions” show at Hellion Gallery. 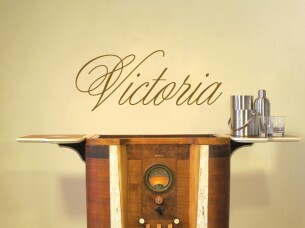 An original Philco stereo system I scored in 2009, it had sat around in my shop for 3 years aching to be restored. It was the recent birth of an up and coming suitcase stereo project my friends had started that started this process. My intentions where to always make it into a mobile bar and iPod stereo system. But after I witnessed the amazing products and engineering that where going into the Case Of Bass products, it was suitable that I let the professionals create something I could have never achieved with my limited wiring abilities. Our studio refurbished, customized the lid, applied ink and spot varnish graphics. Upon completing this, the Case Of Bass crew custom designed a 3 input, bass and volume control, back lit frequency indicator and 8 speakers (2 tweaters, 4 mids, & 2 subs). It sounds incredible.